Quilt Restoration is all about responsibility, cleanliness and proper storage of an heirloom quilt. During colonial times laundry day may have only occurred on a monthly or even quarterly basis. Their only cleaning agent was lye soap and was made by leaching lye from ashes and boiling it together with leftover cooking grease. In the late 40's and early 50's I remember helping my grandma soak her laundry overnight before variously rubbing it on a wash board using lye soap to remove the dirt. Once the dirt was removed she would add soda or borax for whitening. If these same habits were used to laundry quilts, it is incredible that any quilts from the past have survived at all. 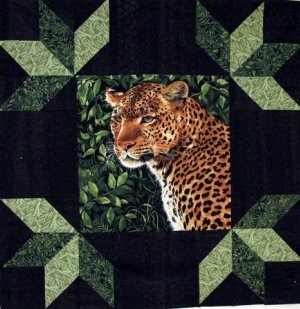 If you are fortunate enough to own a keepsake quilt it is your responsibility to make sure that the quilt survives by using only proven quilt restoration techniques. Whatever way you decide to use the quilt, proper care is of the upmost importance. Actually, proper care is fairly simple and once you understand the process it only requires a minimal amount of effort. Quilts will inevitably age and this natural process can only be slowed. So, it is important to properly care for your quilt, especially if it is of significant historical or financial value. The single most important step is to protect all your quilts against extremes in dryness and humidity. The technological advances in air conditioning makes this easy. 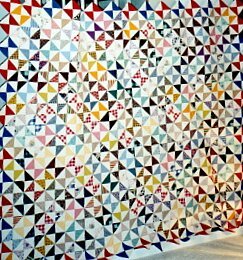 There are proper quilt restoration steps, if followed, will extend the life of an antique quilt. Dry cleaning is NOT a recommended choice as the drying process puts stress on the fabric and is extremely harmful. It is best to avoid any heat application for your antique quilts! The best possible choice is vacuuming. It is a fairly straight forward procedure but requires a bit of preparation. First, inspect for weak points or fragile areas. If your quilt is made of cotton or linen then hand stitch nylon netting over the weak areas. If your quilt is made of silk fabrics, then use silk organza in place of the nylon netting. Now inspect your quilt for any tears. If your quilt is made from cotton or linen, using as few stitches as possible, baste using a 1/4-inch stitch to overlay a patch of pure (undyed) muslin on the front and back of the area. Be sure and use undyed cotton thread too. If your quilt is made of silk fabrics, use silk organza to cover the tear. 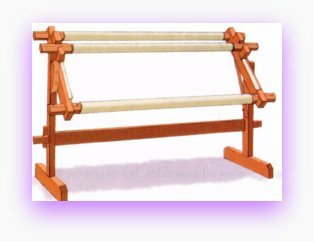 Be sure and use silk thread on silk quilts. You are ready to cover the quilt with a piece of fiberglass-coated window screening (no substitutes). This will prevent the quilt from being sucked into the nozzle of the hand-held vacuum cleaner. Once the entire quilt has been gone over using a lateral motion and then a horizontal motion on both sides, carefully remove the screening and reinforcing materials. Wet cleaning is another option for cotton or linen quilts only. This is a bit risky and should only be used if absolutely necessary. First make certain that all colors in the quilt are color fast. You do this by dropping a small amount of water in an inconspicuous spot. If, after blotting, there is no sign of the colors bleeding then wet cleaning can be used for quilt restoration. Never agitate in a washing machine. Rather, soak in a large tub of water to which wool Lite or a mild soap has been added and large enough to allow the quilt to expand without being scrunched up. Only gently press the quilt or pump the quilt up and down. Never scrub, squeeze, tug, pull or agitate the quilt. It may be necessary to repeat this process if the water shows a lot of dirt. Make sure that you pre-mix the soap with the water before adding the quilt. Once no more dirt is released, drain the water and refill with clear fresh water to rinse the soap. This may take several refills to ensure that all traces of soap have been rinsed out. To reduce stress on the quilt when being lifted out of the water, place a piece of fiberglass-coated screening (no substitutes)in the bottom of the tub to aid in the process of removing the heavy quilt from the water bath. Lift the quilt from the rinse tub with the aid of the fiberglass screening. 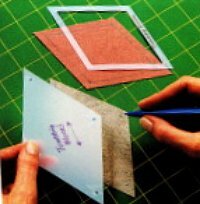 Place on a flat surface like the floor, or large cutting table. This will take a little pre-planning by either spreading a piece of plastic sheeting on the floor or table. Blot dry on both sides using only white clean bath towels. Once you have blotted out most of the water place a fan in close proximity to assist with the drying process. Never hang a wet quilt on a clothesline or put it in the dryer. Remember, dry laying flat and never twist, tug or pull on the quilt. The drying process may take a couple of days. After researching quilt restoration and the history of quilts all suggestions are that maybe you should store any antique quilt in a climate controlled vault. For me I love my quilts and I use them even my 85 year old quilt. However, I do take loving care of them and they are never abused! Why have quilts if you can't enjoy them? Most quilts should be wrapped in undyed muslin or old clean white sheets when not in use. Wrapping opposed to shelving protects them from coming in contact with the acids found in wood and drawer liners which can be harmful to quilts. Lay the quilt on top of a bed and then fold the quilt as few times as possible before wrapping in muslin. To avoid permanent creases tuck a rolled piece of muslin into each fold or you can use acid-free tissue paper in the folds. It helps to re-fold several times a year even though you do not use the quilt. To minimize creases caused by folding the quilt simply cover a large cardboard tube cylinder with a muslin sleeve and then roll the quilt on to the cylinder. Secure with yet another sleeve made from muslin to protect from light, dirt and dust. Store the rolled quilt in a cool dry place. This technique is perfect for small wall hangings or table runners! Tumbling Blocks is an interesting piece of art; why not try your hand with this 32-piece round puzzle!